He rebirth of a dead village and the love of the last inhabitant for a wandering girl. Alice and Nadia are two French women who have little in common except maternal love: they are faced with the challenge of saving their sons from drugs, prison, and death. At forty years old, Martin Belhomme leads a quiet life with his wife and two children. One day, he falls hopelessly in love with Eva, a cabaret singer. He decides to follow her to Amsterdam. From then on, his life becomes very eventful. He lives with his mistress and has an affair with his wife! It is a crime that this film is not available on DVD. It should be required viewing for anyone considering becoming an actor. This comedy is painfully acute on the subject of the million humiliations a working actor must face. 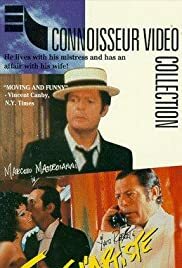 Marcello Mastroianni and Jean Rochefort are both superb in playing second-raters who will never achieve stardom, and who scramble desperately to hold their lives together in the precarious world of showbiz. Neil Simon's "The Goodbye Girl" has dated badly, but "Salut l'artiste" remains as pointed and relevant today as when it was released. This is a much better film.